Erica Marie Vatella has been awarded a James Madison Memorial Foundation Fellowship to study American history. Named for James Madison, the nation’s fourth president, the Fellowship will fund up to $24,000 towards Vatella’s Master’s degree. Vatella’s older brother L.J. is also an Auburn graduate, with degrees in Spanish and Communications. “Growing up, my brother was big buddies with Ryan Pugh, who was an All-SEC and Academic All Conference football player at Auburn, and Ryan’s father often gave us tickets to Auburn games so I came down here a lot for that,” she said. 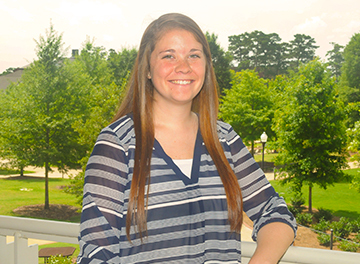 Vatella started at Auburn as a history major, but switched into the Secondary Social Science Education program in the College of Education after just one semester. The award goes to just one outstanding student in each state. Previous Auburn students who won the Madison Fellowship are Julie Bryan Payne (2004)and William Blake Busbin (2006), both from the Secondary Social Science Education program. Vatella said her undergraduate experiences in the Secondary Social Science Education program and the College of Education prepared her very well for her life as a teacher. The purpose of the Madison Fellowship is to give aid to teachers getting a Master’s degree with a focus on Constitutional studies. The value of the Madison Fellowship is not lost on Vatella.